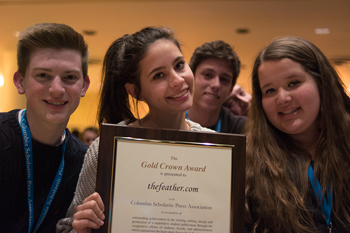 Feather editors Ryan King, Chloe Mueller, Rees Roggenstein and Sara Peterson bask in the glow of a CSPA Digital Gold Crown while at Columbia University, March 20. Since arriving in New York, the staff have awaited this moment with nausea. 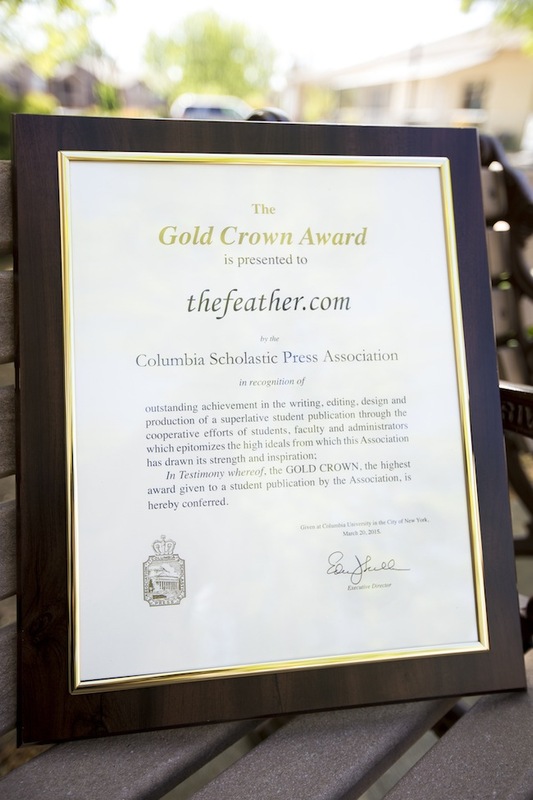 Hoping that they could once again grab the Columbia Scholastic Press Association Digital Gold Crown at the 91st annual convention and continue the winning streak. The team began the day with hope in their eyes. 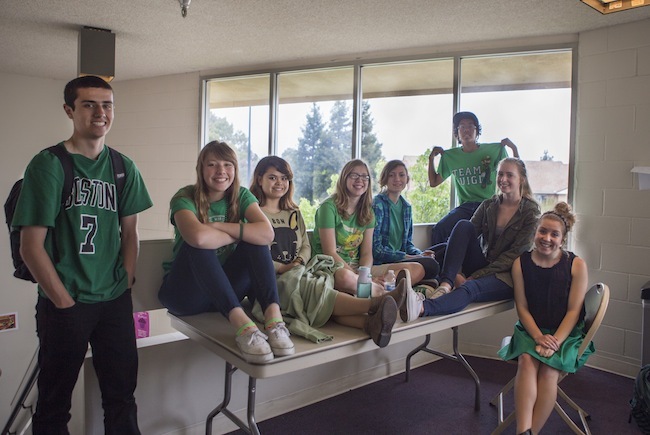 Just like every other day, the team straggled into the lobby where the students met and then left to their various destination. Today their trip to Columbia University and find out their fate. 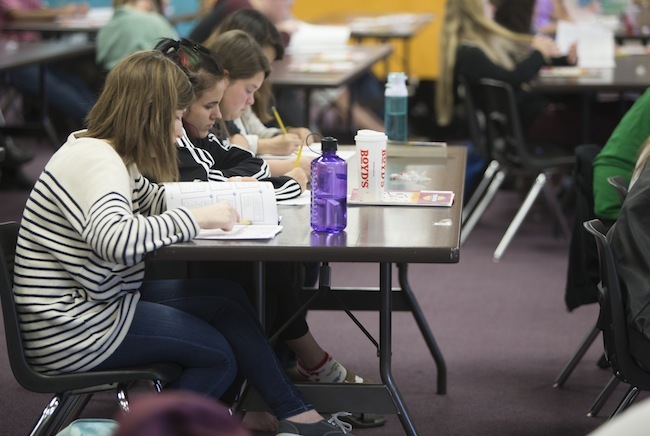 Editors-in-Chiefs Sara Peterson and Chloe Mueller led a class early in the morning, while the rest of team like previous days attended the other various lectures by prominent figures within the journalistic society. After the first class, the team decided to rest and work on the ever needy Feather. Students took this opportunity to rest in the lounges around the college. Finally the moment arrived, the editors filed into the auditorium where their fate rested. Because of the over 2,600 students and 299 schools in attendance, the names of the winners were rattled off in an alphabetical order. The team waited with faces tense and eyes glued to the screen, their time came and went, the Feather had not been called, all the editors turned in shock and confusion. However, God has a since of humor known only to himself. The association misplaced The Feather in the line-up, and ten minutes later were called to the front of the auditorium. The team headed outside to find snow piling upon itself, increasing the joy of their seven-month accomplishment. The entirely new team had pulled it off; they won a Gold Crown, proving that anybody with a heart can make it to the top. After taking numerous photos out in the snow of this terrific event for the school and the program, the team headed back for some rest. After making it back to the hotel, students split off and took a rest in preparation for a celebratory dinner, all fees paid for. Joyful and excited, the team rested and headed off to dinner. The last day touring New York was over and their time to leave had come. For a final time, students will once again rise early, but this time to head back home. This writer can be reached via Twitter: @Josh_Carter. 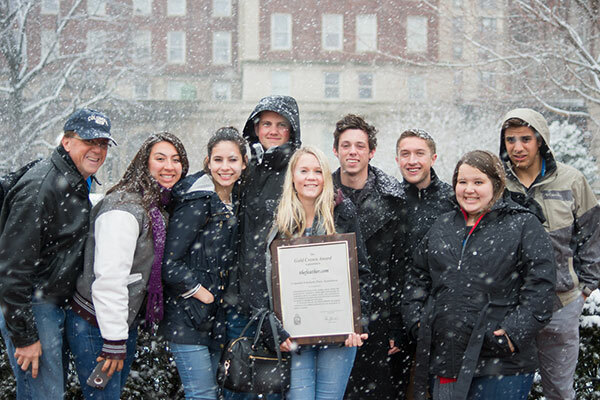 For more news, read the March 19 article, FC hits NY: Day 4 (SLIDESHOW). 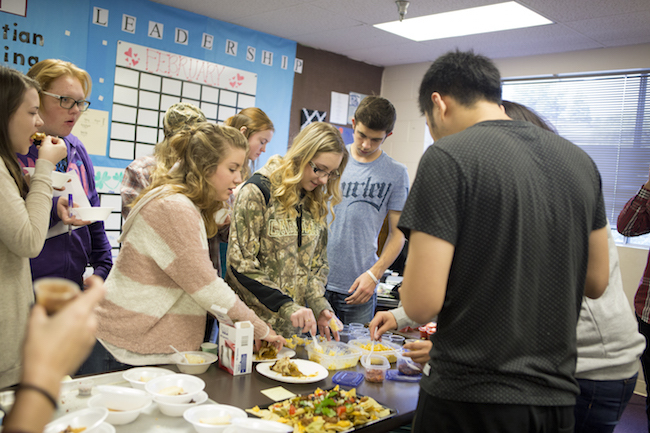 For years, Terry Richard’s junior high classes have learned how to care for young children and practice by using a 5-pound flour or sugar package and calling them their sugar babies. Junior higher’s Emily Tally, left to right, Annabelle Messer and Seth Whigan pose with their Sugar Babies, March 23. The junior high science class has to carry their Sugar Babies all week, March 23- 27. The “parents” will have to listen to the high school CPA officers, the CPA officers can write citations, they can be written up for murder, manslaughter, child abuse, child neglect, harassment and disturbing the peace. If the parent receives a citation, they will have to appear in baby court to decide their punishment. For more photos, visit Elementary track and field and Gold crown. Be sure to keep up with sophomore Julian Castro and the tennis boys via Twitter and Instagram as they are going to the beach and competing at Coast Union, March 21. 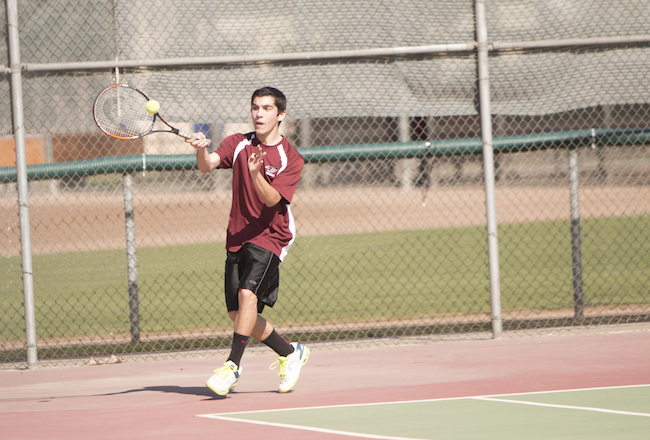 Julian Castro, ’17, rallies with his opponent during the California Tennis Classic. 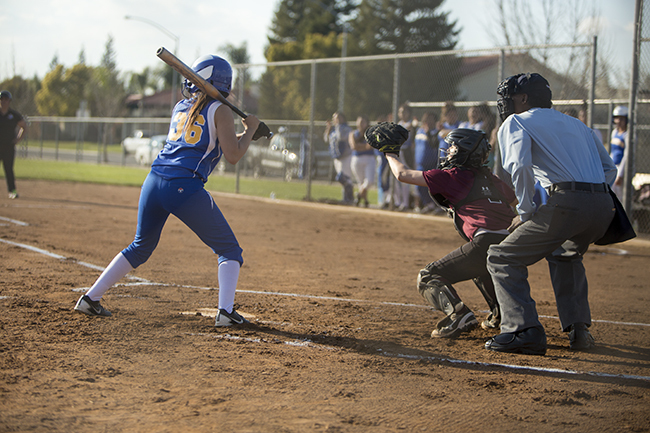 The tennis and baseball team are headed to Cambria to play Coast Union, March 21. The baseball team has a doubleheader and the tennis team has a match. They will leave at 6:30 a.m. in the FC parking lot. For more photos, visit Game Day and Feather on the east coast. The Rock and Worship Road Show is an annual event as will be at the Save Mart Center, March 20. Tickets are $10 and are available online or at the box office. The Rock and Worship Roadshow 2015 is coming to the Save Mart Center start; doors open am 6 p.m., March 20. 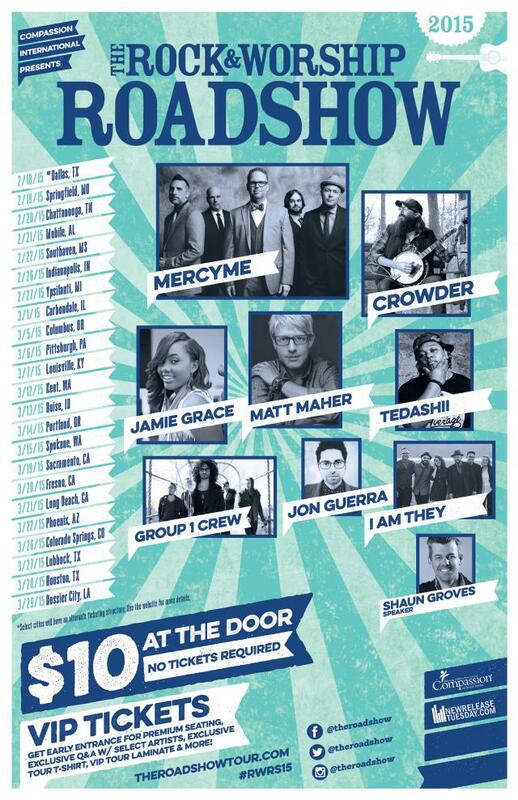 The show features MercyMe, Crowder, Matt Maher, Jamie Grace, Tedashii, Group 1 Crew, guest speaker Shaun Groves, and introducing I Am They and Jon Guerra. 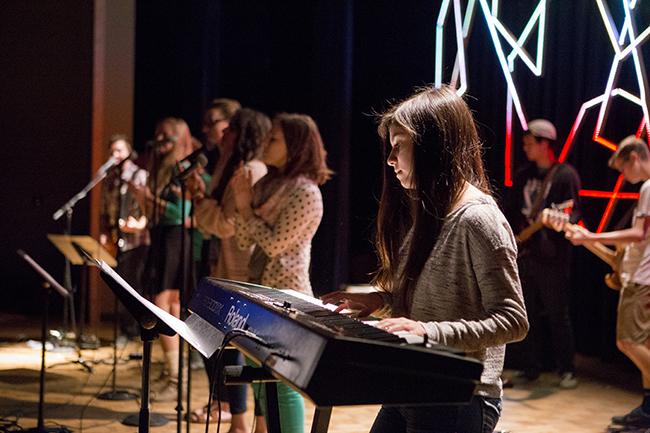 Make plans to come out to Christian music’s most entertaining tour with the whole family. For more photos, visit Game Day and Going to the beach. 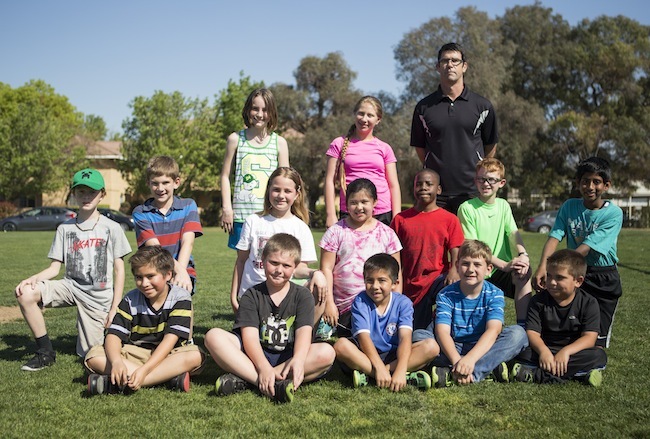 Athletic director Mick Fuller is directing a group of elementary track and field athletes. The junior high and elementary track and field season is here; Co. Director of Athletics, Mick Fuller is the coach for this year’s team. Their next meet is at Sunnyside HS, 1:30 p.m. on March 27. For more photos, visit Rock and Worship Road Show and Going to the beach. 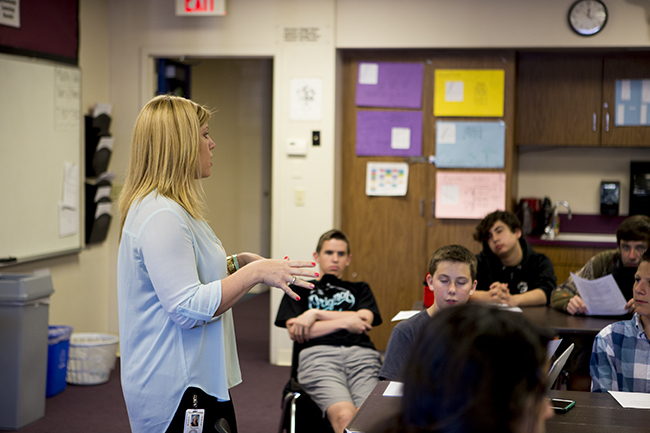 All students are responsible for reading the online student handbook parking lot safety and Principal Amy Deffenbacher recently sent home an email memo. 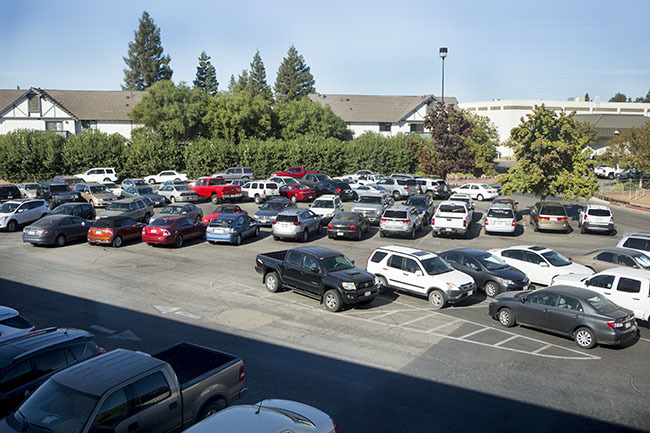 Did you know that everyday over 500 cars come through our campus? Principal, Amy Deffenbacher has recently sent an email home explaining her concerns about parking lot safety. Please make sure you are abiding by the traffic patterns on campus and driving in a cautious and courteous manner. For more photos, visit Hotel Edison and Unified Team. Forgiveness is on the mind of P.E. 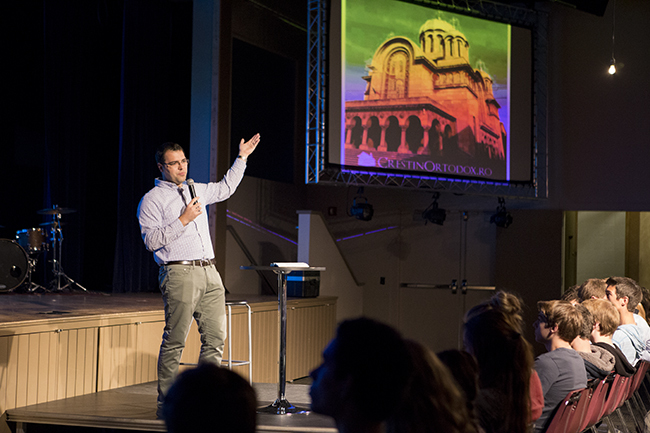 teacher and coach, Jonathan Penberthy, as he shares his testimony in chapel, March 19. P.E. 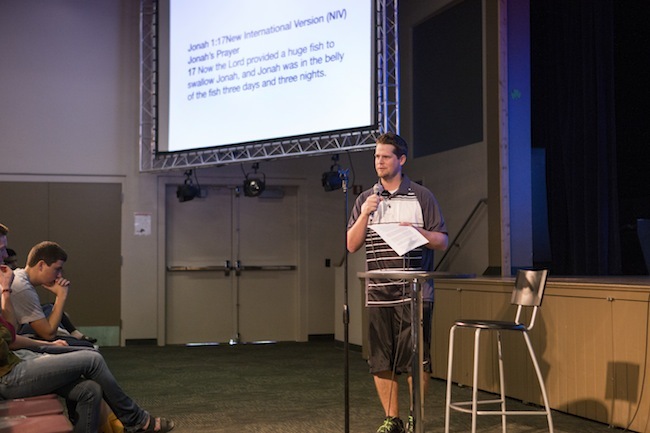 teacher and coach, Jonathan Penberthy shares his testimony in chapel; and its significance to Jonah chapter 1, March 19. In Jonah chapter 1 God sends a big fish to swallow Jonah and he was in the belly for three days and three nights. During this time Jonah repents, he is forgiven and is spit out of the fish to then follow as God had asked him to do. Penberthy shares forgiveness with students that no matter how bad you mess up when God or someone else is there to forgive you they are the people who care for you the most and love you. 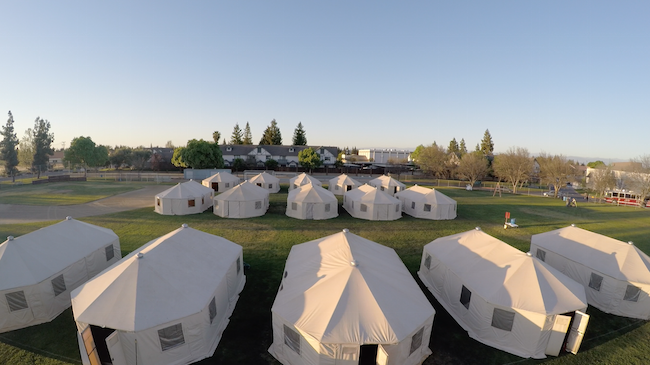 For more photos, visit Hotel Edison and Unified Team. FC tennis team celebrate their victory against Riverdale, March 17. 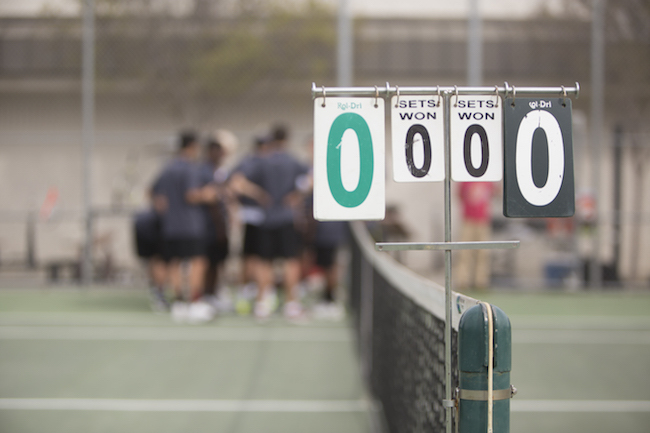 FC boys varsity tennis team won their match against Riverdale, 9-0, March 17. 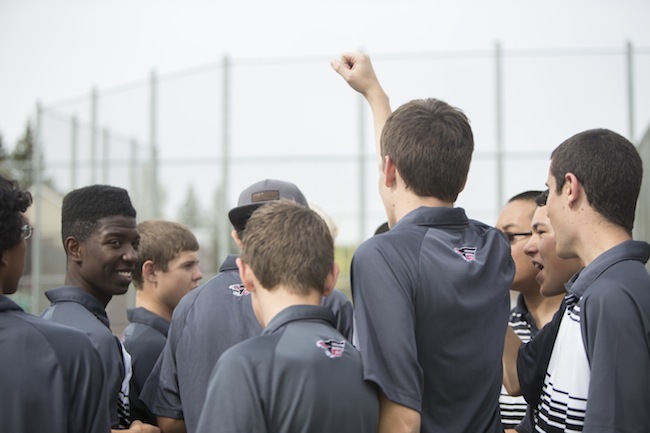 The Eagles prove to be a unified tennis team; being 4-0 overall. 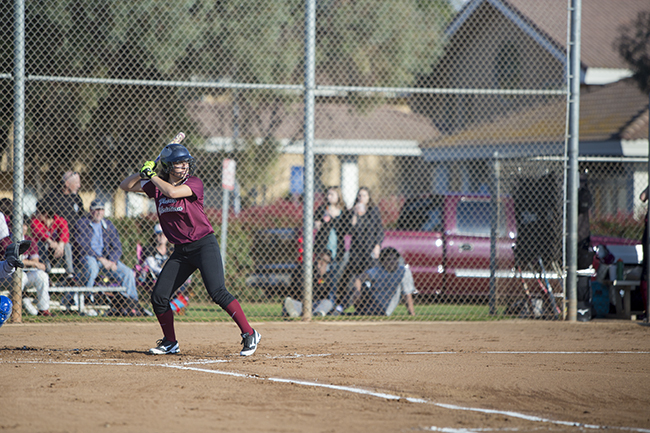 Their next match is in Firebaugh at 3:30 p.m., March 19. For more photos, visit Hotel Edison and Econ fair today. Follow The Feather via Twitter @thefeather, Instagram @thefeatheronline and Facebook @thefeatheronline. Who knew these two would be twins when they woke up this morning. Twinning twins are Kylie Bell, ’16, and Hannah Nale, ’17. Accidental twinning today: Kylie Bell, ’16, left, and Hannah Nale, ’17, accidentally showed up to school in almost identical outfits, March 16. 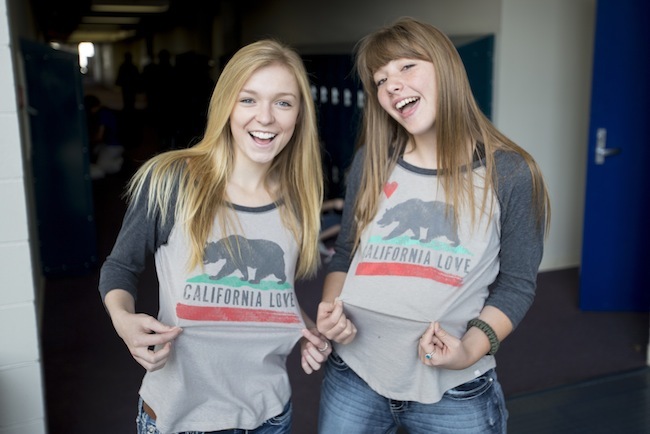 With matching California love shirts, designer jeans, and sandals from the besides their hair you couldn’t tell them apart. For more photos, visit Worship time and Dodgeball tourney. Follow The Feather via Twitter @thefeather and Instagram @thefeatheronline. Those interested in playing intramural dodgeball, should go to the gym to join teams at lunch, March 20. 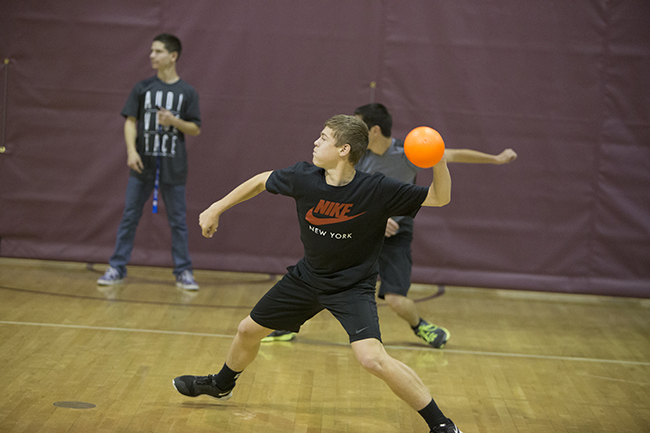 A dodgeball tournament will be help in the Peoples Church gym during lunch, March 20. No sign ups are needed, just come and play. For more photos, visit St. Patrick’s Day and 2015 Auction. The Emily Krieghoff Blood Drive will be on March 20. 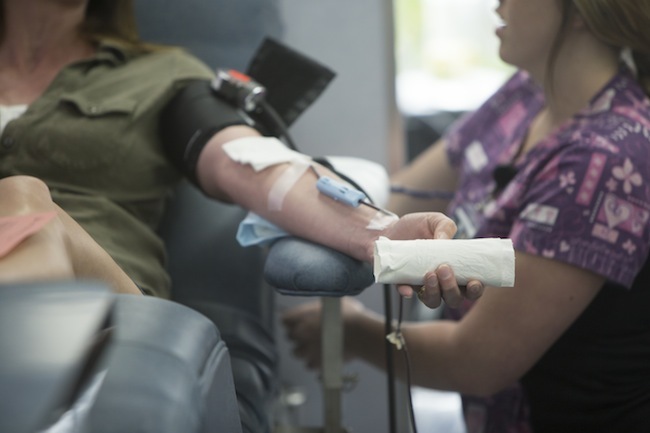 Please consider gifting blood to help a campus alumna. 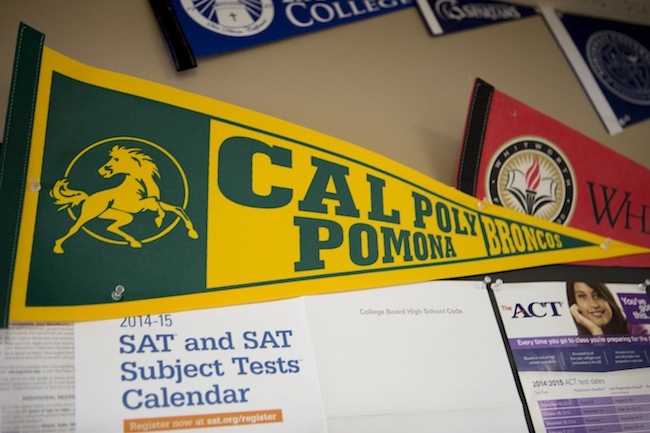 Recently, one of our alumni was in an horrific car accident. 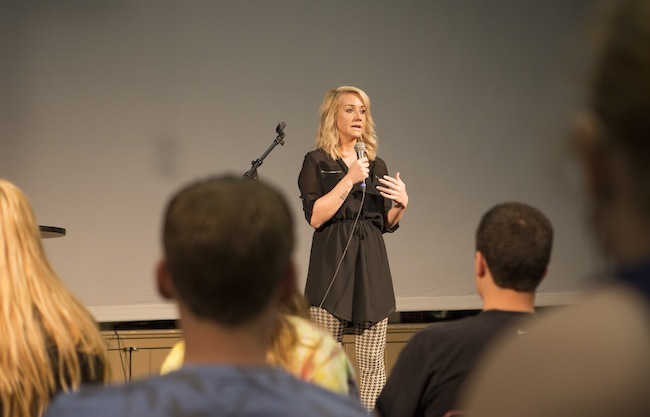 Emily Krieghoff, ’09, was rushed to Community Hospital where if it wasn’t for the grace of God, the surgeons hands, and pints of blood she would not have survived. The Emily Krieghoff Blood Drive will be held in the FC parking lot from 1 p.m. – 5 p.m., March 20. 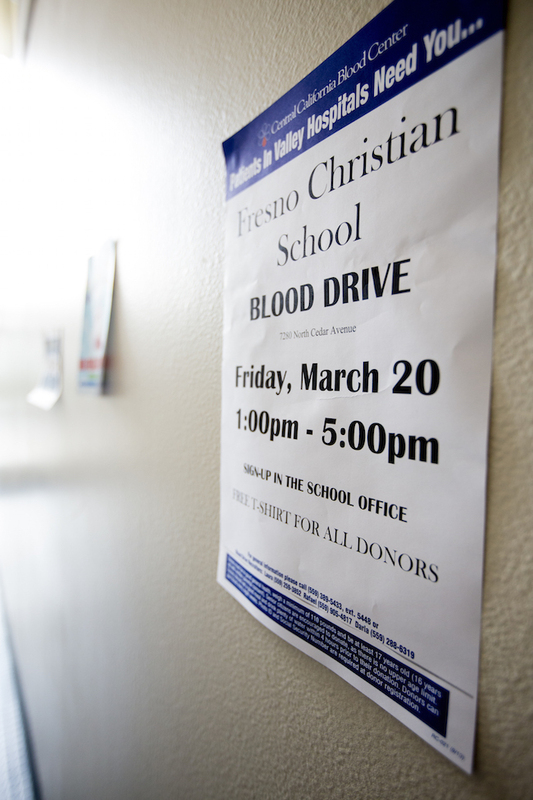 The blood will go to the Central California Blood Center, then will be distributed to hospitals around the Fresno area. 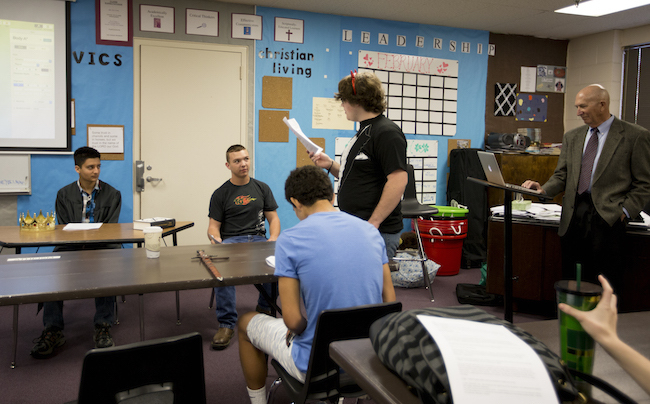 Students role played trials of faith during Robert Foshee’s Christian Living class, March 16. 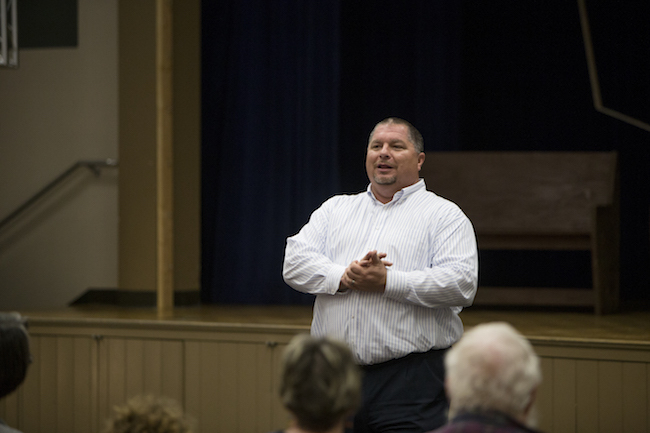 Dr. Phillip Hinton led Rob Foshee’s Christian Living class in a mock trial that battled for the soul of atheist, March 16. Students had the oppurtunity to play roles like the Archangel Michael, Lucifer, and misled normal people in these trials of faith. For more photos, visit Blood Drive and Coming soon. 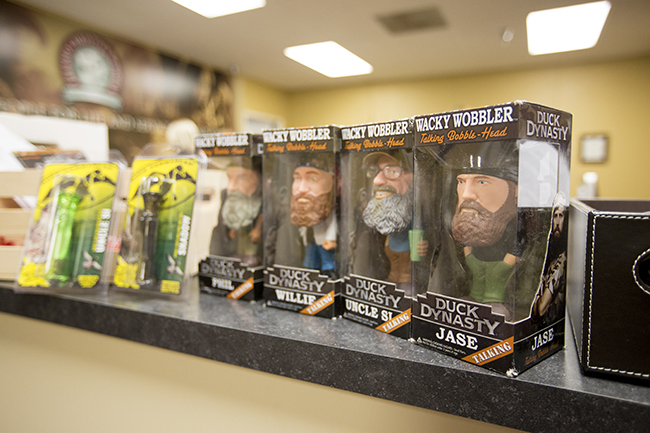 Duck Dynasty bobble heads and duck calls are here in time for the silent auction, March 14. 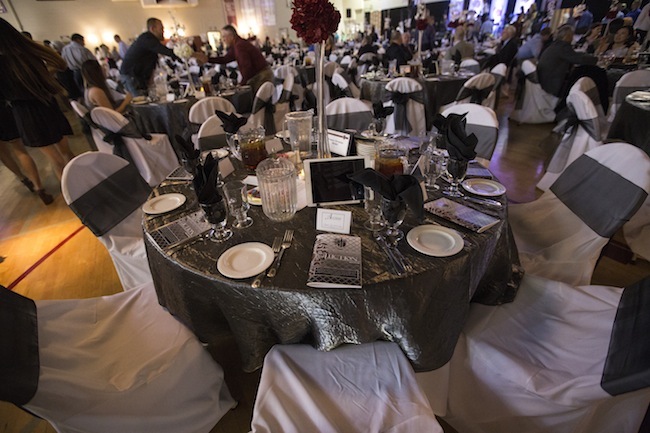 The auction is rapidly approaching us and we are still in need of items to auction off, March 14. The Duck Dynasty bobble heads and duck calls will be up for silent auction. Many gift baskets and desserts will be at the auction also. For more photos, visit International Drone Day and Meet and Greet. 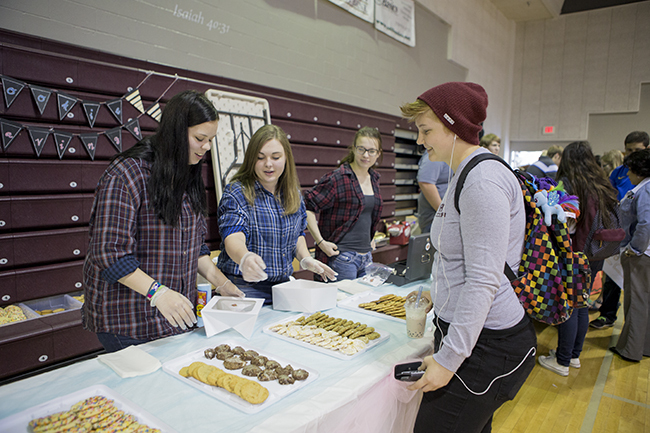 Students from all different classes, work together in preparation for the upcoming FCS auction, March 13. Student and parent volunteers are working on the final touches for the auction. We hope to see some of you there tomorrow night at 5:30 pm. For more photos, visit Support your Eagles and Auction time. 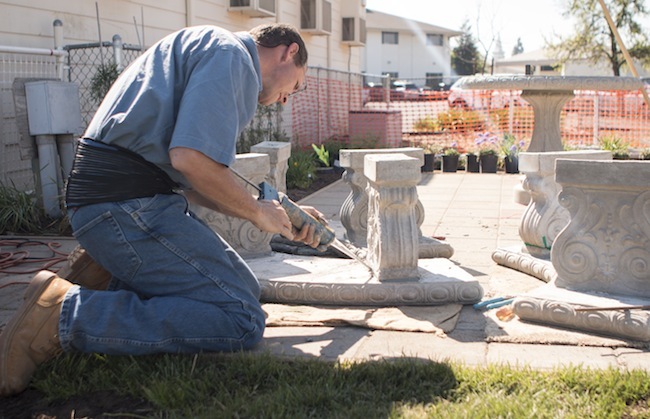 Weeks have passed since the initial start of this project, and we are down to the finishing touches. 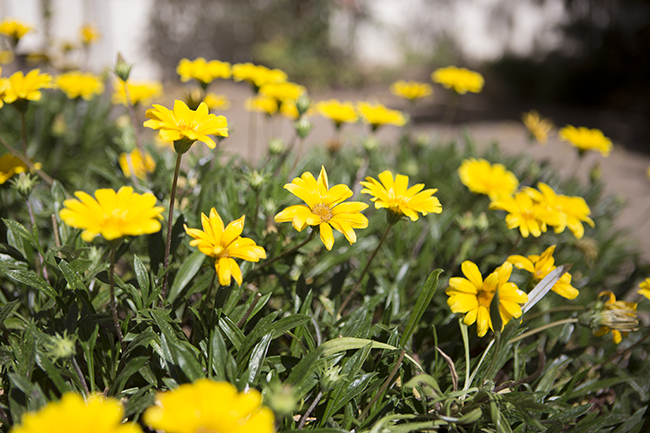 The Pamela Powell Memorial Garden will be highlighted at the FCS auction March, 14. 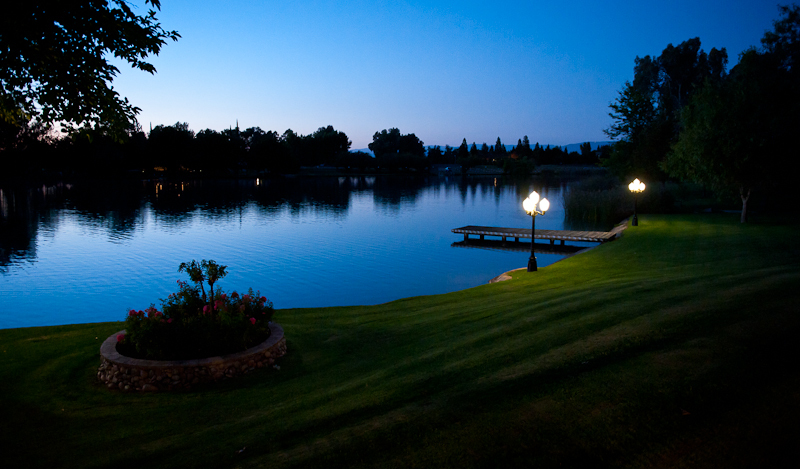 The first stage, of the new and updated Fresno Christian website will be available soon. 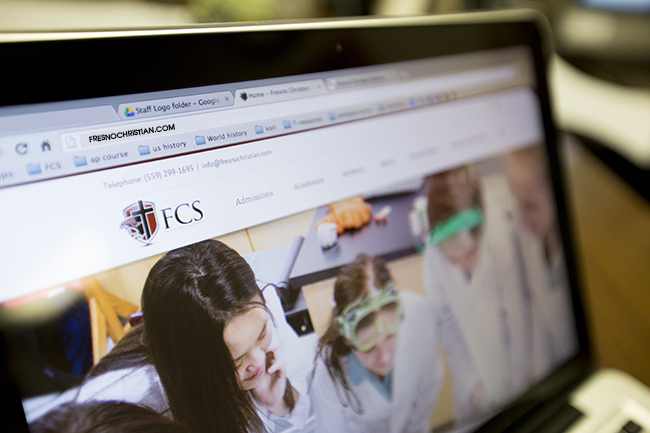 The new website showcases the rebranding that has been in the works since the beginning of Fall. The auction will mark the launch of the new website. iPads will be on the tables at the auction displaying the website for all to see, March 14. For more photos, visit Support your Eagles and All hands on deck. 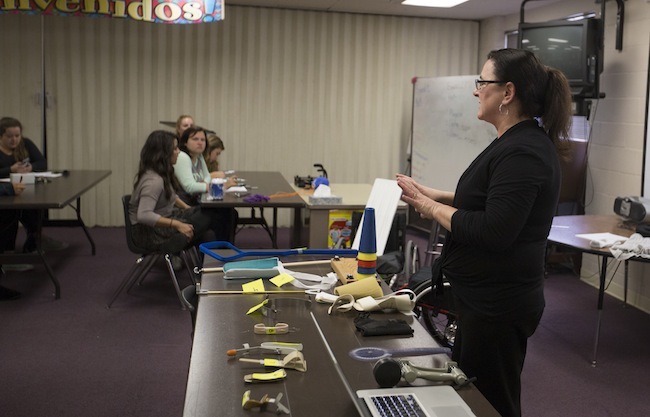 Siqueiros showed students some of her tools she uses to help injured people do daily activities such as put on socks or change television stations. Occupational Therapist from Fresno Community Hospital, Dorothy Siqueiros, and mother of our very own Gabby Siqueiros came to speak in session 3 of Career Day, March 11. For other picture about Career Day, check out the Feather’s Instagram and Twitter accounts. For more photos, visit Balance beams and Crunch time. 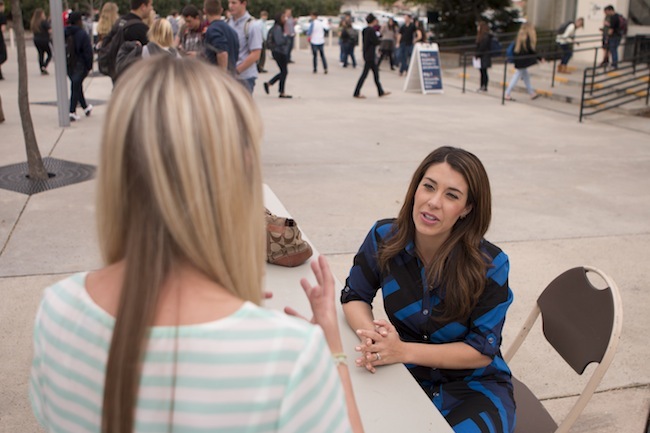 Callista Fries, ’15, left, talks to Reporter, Amanda Venegas about her career in journalism during the meet and greet at the the end of the career day, March 11. Students were given the opportunity to talk to twelve different professionals asking them questions about their careers and how they got where they are. 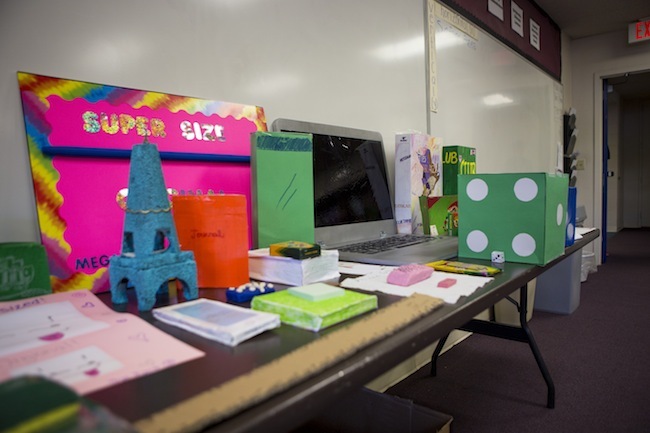 For more photos, visit Dorothy Siqueiros and Career day 2015. 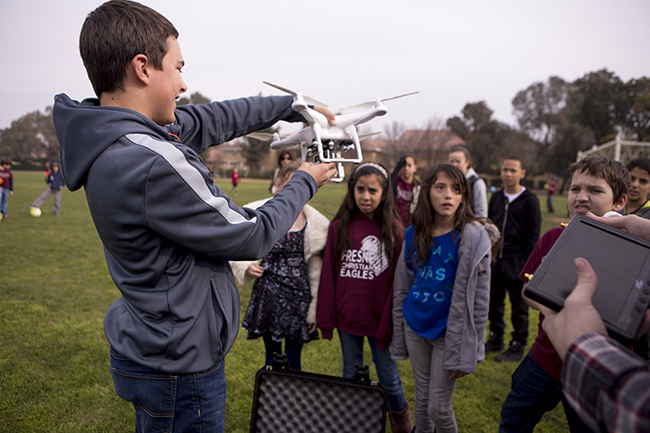 Elementary students ooh and aah watching Jarrod Markarian, ’17 prepare to fly his DJI Phantom 2 drone overhead, March 12.
International Drone Day is March 14, the goal of drone day is to educate the public on drone safety and the correct use of a drone as a civilian. For more info, visit What is International Drone Day? 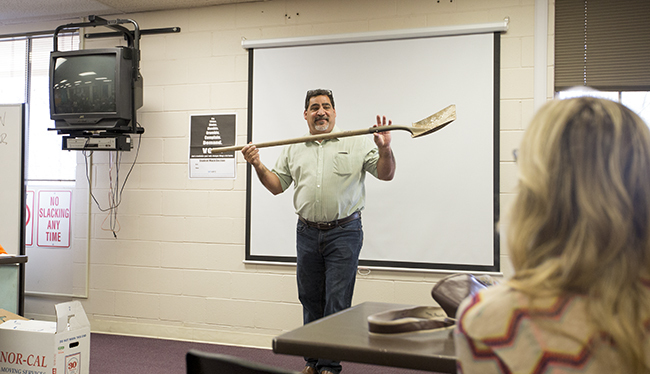 Belmont had the shovel to show were he started, and how far he has come from were he started at the company. 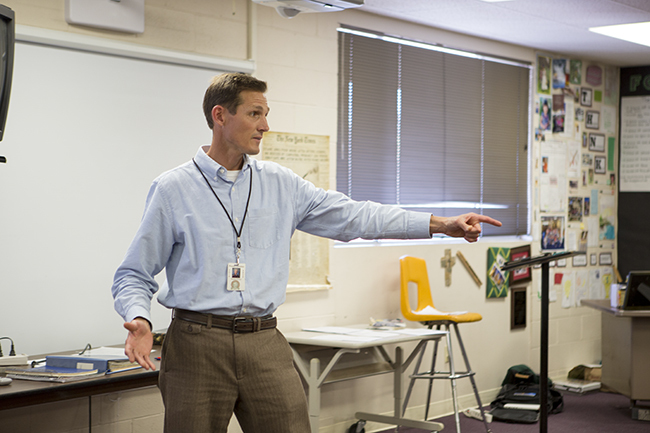 Senior Gas Estimator from Pacific Gas and Electric Scott Belmont, husband of secretary Vicky Belmont, talks students during Career Day, March 11. 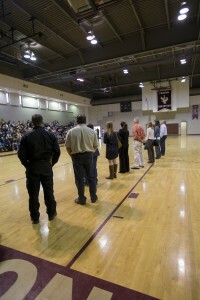 Career Day speakers line up while they wait to be introduced, March 11. The panel of speakers in this year’s Career Day included: Reporter, Amanda Vengas, Ultrasound Technician, Robyn Hill, School superintendent, Jeremy Brown, Engineer, Danielle St. Marie, Prodject Manager(NASA), Suzy Dodd, Nurse, Laura Sherfield, Speech Pathologist, Christie Edmondson, A Fresno Police Detective, CEO/ Business Owner, Jay Cobb, Veterinarian, Dr. Todd Conlan, Occupational Therapist, Dorothy Siqueiros and Senior Gas Estimator(PG&E), Scott Belmont. Each speaker spoke to a group of students about what career they are involved in and information about how they go to be where they are now. For more photo, visit Scott Belmont and Balance beams.